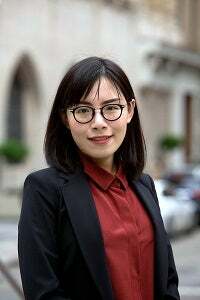 Siyu Yu joined the PhD program in Management at New York University Stern School of Business in 2014. Siyu’s research focuses on the micro-foundations of groups and teams, with a particular focus on social hierarchy, conflict and competition, and cross-cultural organizational behavior. Specifically, she examines how individuals’ perceptions of hierarchy affect their outcomes, behaviors, and decision-making at work, as well as the group-level consequences and cultural variations of of hierarchy perceptions. She is also interested in various antecedents of conflict and competition in group processes. In carrying out her research, Siyu employs a variety of methods, including field, laboratory, and archival studies. Her research appears in Psychological Science. Yu, S., Greer, L.L., Halevy, N., & van Bunderen, L. (forthcoming). "On ladders and pyramids: Hierarchy’s shape determines relationships and performance in groups." Personality and Social Psychology Bulletin. Yu., S. & Blader, S. (forthcoming). "Why does social class impact subjective well-being? The role of status and power." Personality and Social Psychology Bulletin. Greer, L.L, Van Bunderen, L., & Yu, S. (2017). "The Dysfunctions of Power in Teams: A Review and Emergent Conflict Perspective." Research in Organizational Behavior. Kuwabara, K. & Yu, S. (2017). "Costly punishment increases prosocial punishment by designated punishers power and legitimacy in public goods games." Social Psychology Quarterly. Blader, S. & Yu, S. (2017). "Are status and respect different or two sides of the same coin?" Academy of Management Annals. Yu, S. & Xie, Y. (2017). "Preference effects on friendship choice: Evidence from an online field experiment." Social Science Research. Kuwabara, K., Yu, S., Lee, A., & Galinsky, A. (2016). "Status Decreases Dominance in the West but Increases Dominance in the East." Psychological Science.